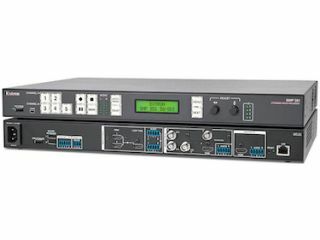 Extron Electronics has released an upgrade to its LinkLicense SMP 351 Dual Recording that enables enhanced recording, streaming, and audio DSP capabilities for the SMP 351 H.264 Streaming Media Processor. This upgrade allows the SMP 351 to record two sources at the same time, at resolutions of up to 1080p/30 and bit-rates up to 10 Mbps. This dual recording capability grants users increased flexibility in the selection of playback layouts with the Entwine EMP video player. The LinkLicense upgrade also includes simultaneous streaming of two separate sources and provides advanced audio DSP features including level controls, filtering, and compressors. The LinkLicense SMP 351 Dual Recording Upgrade can be added when ordering a new SMP 351 processor, and existing units can be upgraded with a LinkLicense Redemption. "The SMP 351 has been incredibly popular with our customers, who are finding more and more ways to integrate the product and have requested new capabilities to support these new applications," said Casey Hall, vice president of sales and marketing for Extron. "With this new LinkLicense upgrade for the SMP 351, customers can simultaneously capture recordings of both a presenter and their content as separate files. This ensures compelling presentations by giving viewers the flexibility to choose their preferred layout." The SMP 351 is a streaming media processor for delivering dynamic presentations to live and on-demand audiences. It is designed for environment where AV sources can be recorded or streamed live. Organizations use the SMP 351 to communicate with staff or students who cannot be present at an event, affording all the opportunity to review and gain insight into the live experience.